Sister Anne Marie Burton, I.H.M. Sometimes I wonder why people are so interested in those who have gone before them – their ancestors. It seems that they rely on outside sources which could cause them to abandon what they thought about their ancestry and to accept new and different understandings of family background. We see examples of these situations on television ads for background checks. Rather than go to outside sources we could go to those family members who can connect us to our own family history. Why should the past and our family story matter to us? Perhaps it is because we realize that who we are is really a reflection of those who went before us. When we lose a loved one, do we wish that we had more conversations with them and asked more questions about their life? Perhaps this could be an incentive for us to sit with elderly family members and listen to their stories – to begin an oral history of our family. These persons can be a storehouse of memories and anecdotes about other family members. Digital photos on a cellphone help to capture special moments of our personal history. Sometimes the photo gallery on the phone fills quickly with a myriad of pictures. There is something appealing about the ability to view those photos and remember the happy occasions. Many homes display family photos of relatives so that others can view them. For many of us, the memories of past events, special occasions shared with people who are important to us, and objects that bring back memories of a special event are valued. Remembering those past persons and events that shaped our lives are important because they serve as reminders of the imprint that we can make on others. Upon reflection, we begin to realize the courage of our ancestors who built a future that we can appreciate and enjoy. As I recall events from my personal background, I remember that hearing the stories of my relatives about family history caught my interest. The stories made me want to meet the people who were the heroes or heroines of the stories. As I explore the Archives of Immaculata University, I regret not collecting oral histories from the sisters who were students or faculty members in the early days of our university. Reading about the dreams and visions that were the foundation of this institution makes me wonder what the persons involved thought about the new adventure, what struggles did they find, and how did they manage to make the dream a reality. Reading the written material can be helpful, but there is a somewhat impersonal element in doing that. Working in the Archives of Immaculata University, I have had the opportunity to read the stories of the early days of our university — making land purchases, working with architects and builders, dealing with state agencies for recognition of academic programs. The photos of the early days and written records provide a glimpse into all that was involved in making the dream of a college become a reality. I am so impressed by the courage and daring of the first Sisters, Servants of the Immaculate Heart of Mary who established Immaculata University. Women, without formal business training, whose dreams and visions came into fruition through their labors. “Remember the days of old; consider the years of many generations; ask your father and he will show you; your elders and they will tell you” (Deuteronomy 32:7). 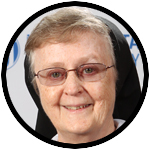 Sister Anne Marie Burton, I.H.M., is professor emerita, Education Division Archives, Gabriele Library, at Immaculata University.